It takes the data from node’s JSON only once per update (2000 ms by default), to avoid double requests. Then it splits this data for each processor (say, OHM0 for Intel Xeon E5-2670 0 and OHM1 for Intel Xeon E5-2670 1), using new and simplified regular expression which generates only 2 indices for the temperature and for the load. It means two different degrees, one for each processor, in Celsius or in Fahrenheit, depending on the OHM’s settings of the node. See also variables.inc inside the installed skin folder to change the scale letter. And the histogram shows the combined usage of both CPUs, simple sum CPU1+CPU2 divided by 2. That’s all for today. 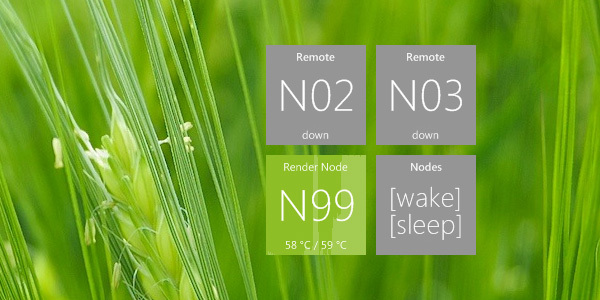 I hope this Rainmeter skin is useful.